Horses are infrequently seen as a motif on rhinoceros horn cups. 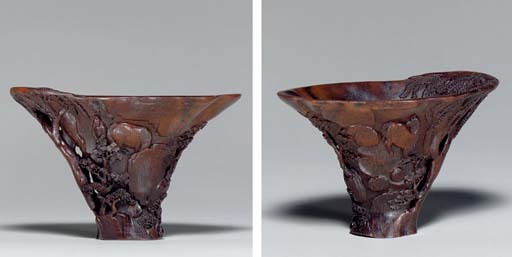 A cup decorated with wild horses in the Chester Beatty Library is illustrated by J. Chapman, The Art of Rhinoceros Horn Carving in China, London, 1999, p. 180, no. 238, where the author notes that when depicted they are either shown being ridden or as wild in a landscape. On the present cup, the two horses are in a landscape setting but being tended by a groom. Another cup in the collection of Thomas Fok, which depicts the Eight Horses of King Mu in a landscape with a groom, is illustrated in his book, Connoisseurship of Rhinoceros Horn Carving in China, 1999, pp. 228-9, no. 168.